A local race shop put out a feeler Tuesday on facebook looking for a stock 1.6 Miata exhaust manifold. 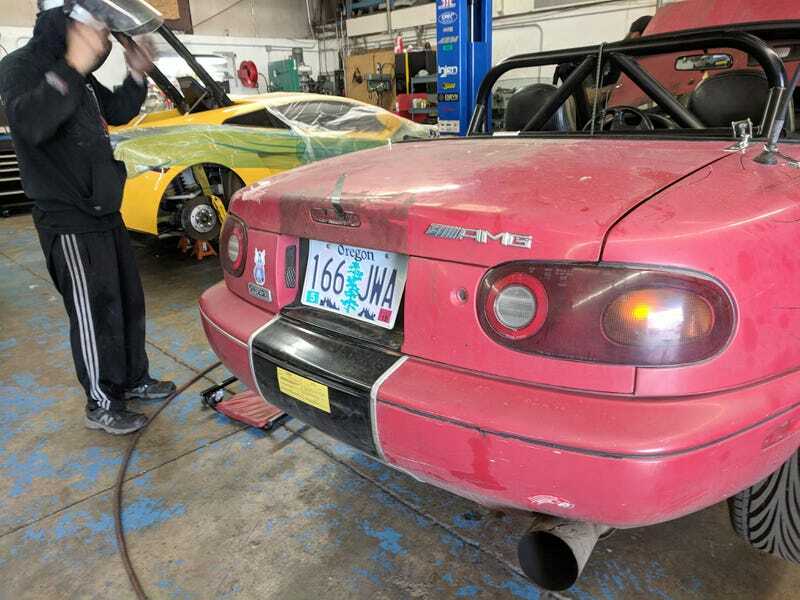 Apparently, they are in the process of converting an old track Miata into a spec car and couldn’t find a stock manifold from their normal sources on short notice (race is tomorrow, I believe). A friend tagged me in the post and I got in touch with them. They offered to swap on the longtube header and exhaust from that car in exchange for my 1.6 factory header. They also said they’s throw in the cheap coilovers it had and some interior panels that are much nicer condition than mine. Couldn’t really turn down an offer like that so I swung by today and let them have at it. Also scored a pretty cheap hardtop they had laying around taking up space. Driving back, exhaust is a little bit loud, but that kind of matches with the rest of the car so I’ll leave it like that a while. Of course, if I blow sound at the track I’m putting one of my spare stock mufflers back on.